Posted on September 25, 2017 by revivewa	in Reviews. If you wander around the Pioneer Women’s memorial fountain in King’s Park, you will find a winding path down the hill. On that path are the names of women’s organisations which have been significant in civil society in WA. Nearby is the Centenary of Western Australia Women’s Suffrage Memorial. It commemorates the hundredth anniversary of women achieving the right to vote equally with men in Western Australian elections. For many of us, this place is just a pretty place to have a picnic or take the kids during the school holidays. How many of us know the story of the struggle to achieve the vote for women? How many know how the first women to be elected to parliament struggled to achieve in a male dominated environment? I found the biography of May Holman, written by Lekkie Hopkins, to be an interesting portrayal of an impressive woman, whose achievements and interests were wide ranging. The list of organisations she was serving as secretary or president, whilst being a serving Labor parliamentarian and representative for the seat of Forrest (elected five times), was enough to make me want to lie down for a rest in a darkened room. Some of these are the organisations named on the Kings Park memorial pathway. 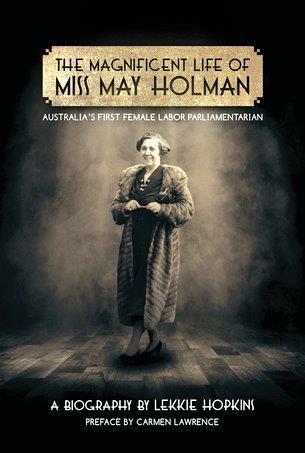 May Holman was a significant woman of her generation, during the 1930s in Western Australia. She worked very hard to improve the rights of timber workers, the support provided by the state for women and children, and yet had time to organise concert parties in which she both sang and played. She was sponsored to attend a meeting of the League of Nations in Geneva and returned with an even stronger determination to work towards peace. We will never know what May Holman may have achieved had she not died in a car accident whilst on the election trail. Her death was a shock which was felt across Australia and caused the kind of outpouring of grief which later generations felt for Princess Diana. Lettie Hopkins has documented the public and private life of a significant woman of our history. It is worth us knowing and appreciating the legacy May Holman left for us.